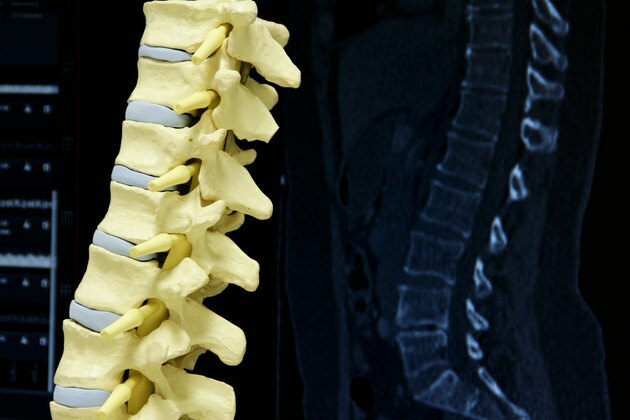 A compression fracture is the collapse of the vertebral spine usually caused by trauma to the spine, osteoporosis or tumors on the spine. They are most often found in the elderly with osteoporosis. Most mild to moderate compression fractures are treated with immobilization or braces for anywhere from six weeks to three months, notes Dr. Thomas A. Zdeblick at SpineUniverse. Braces are utilized to alleviate the pain, reduce the chance of further injury, prevent deformity, compensate for muscle weakness and allow injuries to heal. A hyperextension brace is designed to prevent the forward movement of the spine. It does allow side to side movement as well as trunk rotation. They are commonly used for individuals with compression fractures of the lower thoracic and upper lumbar spine. The brace puts pressure on the pelvic bone and the chest to keep the spine in the extended position. They are usually designed with a metal rod with pads attached to it, that when adjusted are strategically placed on the chest, abdominals and pelvic bone. A corset brace is easily identified, as it looks similar to the corsets worn by women centuries ago. A corset brace is comprised of a flexible material that is laced up around a person’s trunk. They typically cover from just below the sternum to the pelvic area. They are often made of cotton or nylon but do have metal or plastic stays in them to limit forward movement. The corset brace puts pressure on the abdominal cavity to alleviate pressure off of the spine in order to promote healing. A corset brace can come with laces or Velcro for adjusting. Molded jackets are a more rigid brace that covers the entire upper and lower back, including the sacrum. This type of bracing is custom-made for the individual. They are made of hard, lightweight plastic with a soft lining for comfort. The molded jacket brace prevents the spine from moving in any direction, front, back or side-to-side, as well as limiting rotation. What Are the Treatments for Lumbar Scoliosis?